Lundy painted furniture has some exquisite details and is crafted from solid pine throughout topped with oak which itself is a work of art with the subtle detailing, beaded lower edge and curved centre leading to the squared top profile. This smooth painted furniture collection is designed to have an a traditional look with a modern twist that is subtle enough to fit in the most modern of homes. The Lundy 3 drawer painted bedside chest comes in various finishes. 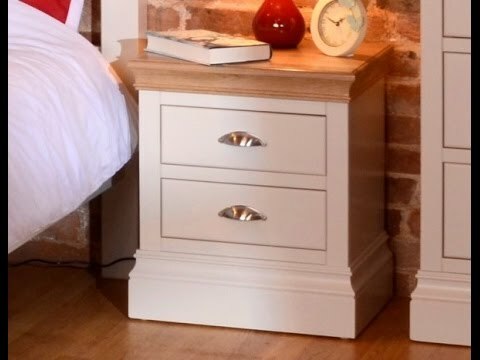 The finishes shown here are a selection of the most popular from the Lundy painted furniture range, available fully painted or with the oak top, also options with metal cup handle (as seen here) or oak knob, but there are many more to choose from. To see more, do pop in store where we have ample displays or call on 0800 1223334 for more information. As always you are more than welcome to collect (please do call 0800 1223334 for availability) and this unit is fully assembled or if you prefer you can arrange to have your bedside delivered by our experienced delivery teams who will unwrap and remove all packaging leaving you to enjoy this gorgeous furniture.